If that special someone has more trinkets and baubles then she can use, why not make a donation to Riders for Health, our favorite motorcycle-related charity on her behalf? It's easy to go to Riders.org/donate and contribute to this wonderful cause. 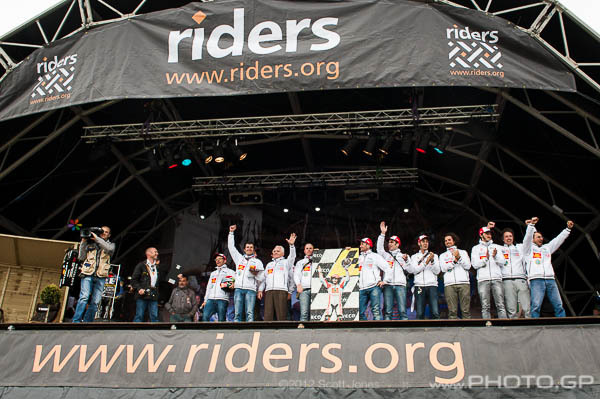 If you've not heard of Riders for Health, here are some photos from their biggest fund raising event, the Day of Champions held each year at the British Grand Prix. Riders helps provide motorcycles and the training to operate and maintain them in African countries that have no other way to distribute much-needed medicines to remote villages. Their work supports millions of people and has saved countless lives in communities with no access to modern hospitals, and where lives are at risk from preventable diseases. Riders is the official charity of the FIM. I've been honored to be included in the DoC auction for the past several years. I've been able to help as I can back stage and thus had the opportunity to observe first hand the incredible job the Riders folks do to make the fundraiser such a success. Click on any photo to see it and others in the DoC gallery at PHOTO.GP. But you don't have to wait for Silverstone to support this amazing charity. Making a donation on someone's behalf this holiday season is a great way to make a truly meaningful gift and support a wonderful, life-saving cause. Just click here to donate! 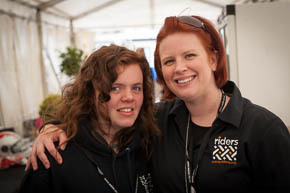 With her husband, Barry, Andrea Coleman is the driving force behind Riders' work in Africa. It has been my honor to get to know her and each time I'm lucky enough to share five minutes of her time I come away inspired and amazed at how hard she works to help other people. She is truly one of my heroes in life! The MotoGP riders do a lot to support their charity, donating their time on stage as well as unique items to be auctioned off at this fundraiser. 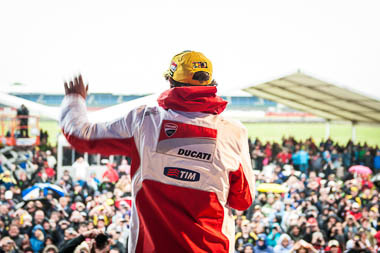 As you'd expect, no one gets more from the crowd than Valentino, but all of the riders make meaningful contributions. 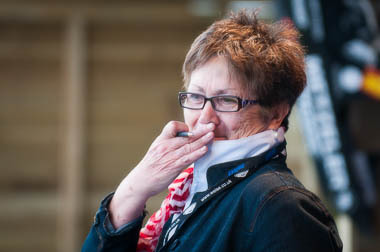 Though the back-stage workers don't make it into the limelight, their work organizing the auction items, supporting the presenters, and generally making the auction run smoothly deserves much more credit than it gets. One of the best parts about helping with the auction is seeing these lovely people once a year--they are all fantastic! It's not only the riders who folks come to see. 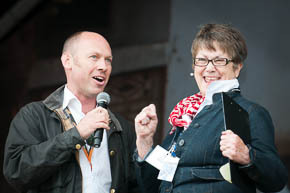 Toby Moody and Julian Ryder are among the celebrity announcers who get the crowd going with their presentation of interviews, witty banter and auction information. In the cold, wet, windy weather (did I mention it's in England? ), Toby and Julian spend hours on stage keeping the crowd involved as only they can. So if you can't ride a GP bike, or keep the crowd going with a mic, or help out back stage, you can always send in $20, $50, $100 and make a real difference in the lives of people who desperately need a malaria shot. A charity donation gift is something you can really feel good about giving, and Riders for Health truly deserves your support! 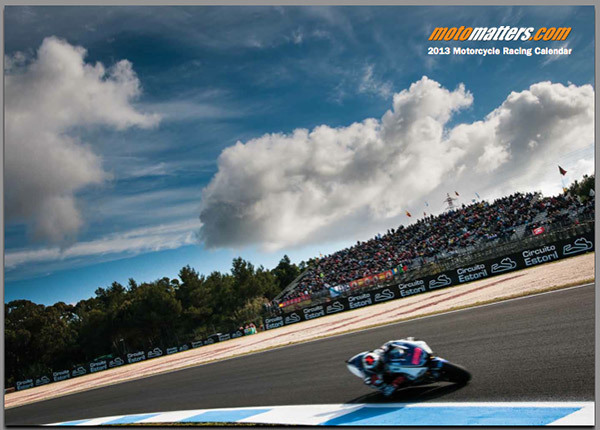 The 2013 MotoMatters calendar started shipping yesterday and we're doing our best to get orders out asap. We really appreciate those who have volunteered to let others waiting for gift calendars move ahead of them in the shipping queue. That's some wonderful holiday generosity! U.S. orders should receive their calendars by Christmas, no problem, as long as orders are placed soon. Click on the photo above to go to the order page. Did you receive this newsletter from a friend? Join Mailing List.